According to the British Association of Aesthetic and Plastic Surgeons (BAAPS) it is estimated that around 50,000 people in the UK choose to have plastic surgery each year, and around 10,000 women choose to have breast augmentation – it is one of the most popular operations. 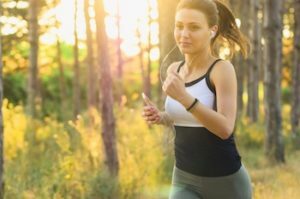 For those who choose breast implants, there are a few things you should consider to ensure that your body adapts to its new size and shape, and one of the most common questions women ask is on exercise and breast augmentation and, in particular, how they can ensure that exercise doesn’t negatively affect their new breasts. Many of us undertake some form of regular exercise. Whether this is something low impact like walking or swimming or high impact such as HIIT or running, here are some simple guidelines to follow in terms of when you will be ready to get back to the exercise you want to once you have undergone a breast implant operation. As a rule of thumb, four weeks is often the ‘magic number’. If you are looking for a starting point, four weeks is a sensible starting point before you should start any type of exercise regime following surgery. This should be treated with caution though, as everyone heals at different rates, and it is very important to listen to your own body and make sure that you feel up to it. It also really depends on what you want to do. Starting at the gentle end of the spectrum, walking on the flat is a great place to start. It will make you feel happier and healthier and is something you can take at your own pace. If you are keen on more strenuous power-walking or hill walking, then ease this back in gradually. If you wait a month or so to begin walking and then build it up gradually, over the coming weeks and months you can begin increasing the intensity of your walks and getting back into something more strenuous if that if your preference. Swimming is also a good starting point as the buoyancy of the water will help you exercise while not putting pressure on your healing breasts, but try using a float and swimming using your leg muscles to start off with, rather than opting for the more strenuous strokes that require more upper arm and chest strength otherwise you will find you ache a lot after your swim. In the early weeks, the advice is always to avoid sports and activities that impact on your breasts, as it is important that you give them the necessary time to heal. You will also be more prone to infections while you are healing from surgery, so make sure you don’t put your body under unnecessary stress or pressure. What happens if I push it too far too soon after breast implant surgery? High intensity exercise, such as running or cardio classes, entails a constant up or down motion of the upper body that can slow down the recovery process. After breast implants are inserted into the body, a capsule forms around the implants and this process can be impeded, with scar tissue developing that can result in pressure and hardening. The implants could even shift from their exact placement. Wearing a very supporting sports bra or compression garment is essential. The best advice is to take your time, relax and give your body time to heal. Mr Alan Park will give you help and guidance about when they feel it is appropriate for you to begin exercising again, and this will be guided by your overall physical health before the operation, the amount of exercise you did prior to the operation and other factors such as your age and weight. If you are feeling ready to begin exercising again but have concerns about the timings of this, get in touch to ensure you get the balance and timing right for you. Low self-confidence with breasts and ways to overcome this I am 65 – am I too old to consider a facelift?